As an adult with ADHD you know that feeling of overwhelm all too well, I’m sure. In the moment it can feel as though your brain is flooded, causing it to short-circuit. And you can’t even think straight. Without the ability to figure out what to do in the moment you may panic. And then go into fight, flight or freeze mode. Above all, you just want to escape! No doubt, everyone has challenges in their day-to-day life, leading to overwhelm. But your ADHD challenges may be causing you more overwhelm than your non-ADHD family, friends and, colleagues. And your overwhelm, in turn, can exacerbate your ADHD symptoms. So, figuring out how to manage your overwhelm is an important piece of learning how to work with your ADHD. In the hypothetical scenario below Kerri is struggling to work on a report that is due in 4 days. But, as she sits down at her desk, after her last meeting of the day, here is what happens. Asaf seemed upset that the product rollout is delayed. He probably thinks it’s my fault. I’ll have to deal with that later. I really need to get down to work now. Oh, maybe I should answer that email from Paul that just popped up. And I should return Sari’s call, too. I’m never going to get this report done in time. I can’t believe Asaf is blaming me. I’ve been promising to call the plumber for a week. I should do that now. But I don’t know when I’m going to schedule it. I’ll have to call him later. She tries to work on the report again. Until she remembers she promised to be home by 6:00 for dinner. It’s already 4:30. Her overwhelm is on the rise. The stress is mounting. And by 5:00 she finds herself reading the paper online, instead of working. Like Kerri, when you are overwhelmed, you may avoid doing anything. Because you just can’t figure out how to cope with everything that’s on your plate. Alternatively, you may jump to act just to avoid the discomfort of not being able to decide. But you have no plan or sense of priorities. When you experience similar situations, like Kerri’s from above, you might get down on yourself and even feel shame. Knowing how your ADHD might be contributing, not only can help you create the right workarounds, but also can help you feel more compassion for yourself. Below are a few ways Kerri’s ADHD might be implicated in creating the above scenario and leading to her overwhelm. Like many adults with ADHD, Kerri wasn’t very good at creating plans to complete larger projects over time. So, while she kept on thinking about the report, she didn’t start it. Even though she had known about it for a month. And the worries just kept growing. At the same time, because of her poor time sense, she told herself she had more than enough time to do it. After all, it was a month away. That seemed like a long time. So, she didn’t feel any sense of urgency until the beginning of the week it was due. But, when she finally sat down to work on it, she had a really hard time. In part, she was having difficulty transitioning from the meeting she had just had with Asaf. She also had a hard time managing the distracting thoughts of everything else she had to do. Eventually, she was unable to manage her frustration. And started reading the paper, which was one of her automatic responses to overwhelm. All in all, you can see how Kerri’s ADHD exacerbated her overwhelm. Have you ever found this to be true for you, too? Check out more examples of faulty thinking and strategies of how to avoid these negative thinking traps that might be contributing to your current feelings of overwhelm. In some cases, though, this faulty thinking may be a result of negative automatic thoughts — thoughts that occur without conscious thought — stemming from the beliefs you have about yourself. And, because these thoughts are habitual, you cannot control them directly. However, you can learn how to control them by challenging the beliefs that led to them. You might decide to try cognitive behavioral therapy. Also, Mind Over Mood, Change How You Feel by Changing the Way You Think, is an excellent guide you can try on your own or in conjunction with a therapist. Whatever path you decide to take, identifying and addressing your faulty thinking and beliefs is an important key to managing your overwhelm. Just as your ADHD and thoughts may contribute to your overwhelm, your overwhelm can make your ADHD symptoms worse. Think about the various executive function challenges you have because of your ADHD. These may include difficulties in making decisions, planning, organizing, regulating your emotions, transitioning, etc. And, when you are stressed and overwhelmed, these challenges can be even greater. When you are overwhelmed you’re likely not operating very effectively. And, while this may feel incredibly distressing, the outside world is probably not aware of your internal experience. After all, you may have reached a certain level of success because of your ability to hide how you are feeling. And it may seem to them as though you are lazy, don’t care or are incompetent. You are none of these!! Your brain has simply been hijacked because you are overwhelmed. 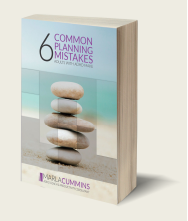 Of course, there are many strategies you can learn to minimize the chances of getting overwhelmed in the first place. And you’ll want to learn these. But, even when you start learning the strategies, there will still be moments of overwhelm. So, in addition, you can start practicing the strategies below to manage your overwhelm in the moment. First, when you start to feel overwhelmed, notice the feeling in your body. It may be a tight stomach, fuzzy feeling in your head or some other sensation. This is your cue that the overwhelm cycle is beginning. You may have a habitual response to overwhelm. Check out ADHD and the Habit of Overwhelm to learn more about this. The first step to take in learning new coping mechanisms and unlearn old ways of responding to your overwhelm is to pause when you notice the cue. Because you may not be able to figure out what to do next in the moment, the next step is to take a break. It will depend on the context as to what type of break you’re able to take, of course. For example, if you’re working alone, you may decide to stop working. If you are in a meeting, perhaps you excuse yourself to go to the washroom. And, if you are having a one-to-one conversation, you might ask to reconvene at another time entirely. Once you have slowed down, pay attention to the negative self-talk that is contributing to your overwhelm. Then work on replacing this negative self-talk with a more balanced perspective. I have a lot to do right now. But it’s getting late, I’m tired and things always look bleak when I get to this point. I should stop now and ask Tori if she has time to help me sketch out a plan. Because this is hard to do on my own , even when I’m at my best. And maybe later I can talk to her about Asaf, and see what she thinks. Because I could totally be off base in what I’m thinking. Engaging in self-talk that is more balanced will help you avoid shutting down, procrastinating or acting impulsively when you become overwhelmed. In some cases, it might be enough to take the above 4 steps to reduce your feelings of overwhelm. But, once you feel more grounded, you might decide it would be best to come up with a plan to address the cause of your overwhelm. And the best way to do this is to approach it from a solution focused perspective. Check out The 6 Steps ADHD Adults Use to Solve Just About Any Problem to see how you can do that. 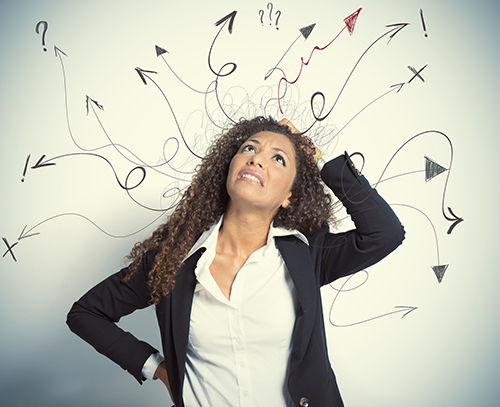 Becoming overwhelmed may be a result of your ADHD, as well as your thoughts. It can also exacerbate your ADHD symptoms. And it can be distressing. But following the steps above you can become more grounded and minimize your sense of overwhelm in the moment.